I can tell already that Eddie is a To Do List kind of guy. He likes to hold any list we make when we go to the store, although he doesn’t make the best “reader of the list” since he tends to make stuff up when you ask him what’s next. We have used charts for things like potty training and staying in bed and so forth. 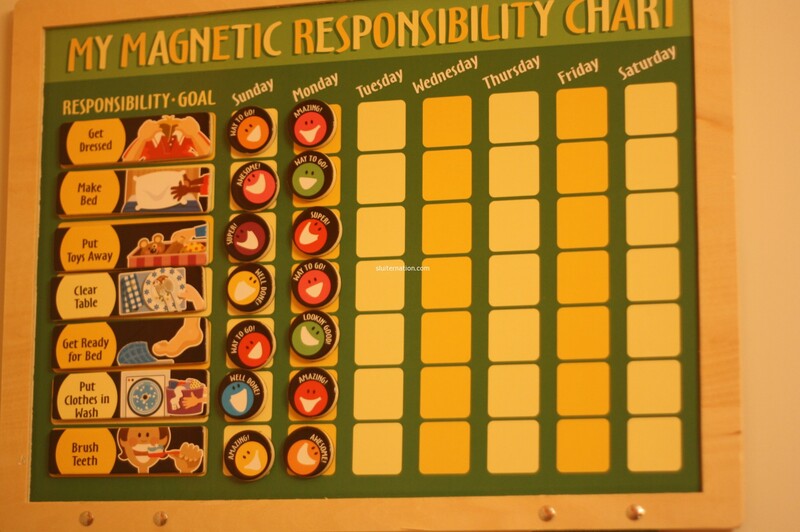 A while ago we introduced him to a responsibility chart (not an affiliate link, I just like this product). We used it for things like getting dressed by himself, brushing his teeth daily, saying please and thank you, showing respect, etc. He liked this because each night before bed we would go down the list and put smile faces by the things he remembered. After a while though, his behavior was great (most of the time) despite whether we remembered to do the smile faces or not. It was time for a new challenge. Eddie is four years old and has been asking a lot about how much things in the store cost. He can read the numbers, so he often will try to read the cost, and he is beginning to understand that a few cents is not as much money as a few dollars. Often at bedtime he will ask Cortney if he can buy a new book for the tablet, but Cort explains to him that they cost money that isn’t in the budget. Sometimes he IS allowed to choose a book, but we give him a budget. Eddie has noticed the money signs by each book and knows that anything over $2.99 is off limits. Because the smile face routine was getting old (and we would forget to do it), and Eddie was interested in how much money things were, we figured it was time that he earn some of his own money and learn about saving and spending. When school started this year, we took down all the “responsibilities” on his chart that should be intrinsic and not paid to do (show respect, apologize, etc) and replaced them with tasks like putting his laundry in his basket, making his bed, taking his dishes to the sink, etc. We explained to him that now that he is in school, he could learn to earn, save, and spend some money. For each day that he gets a smile face next to EVERY TASK, he gets a quarter. 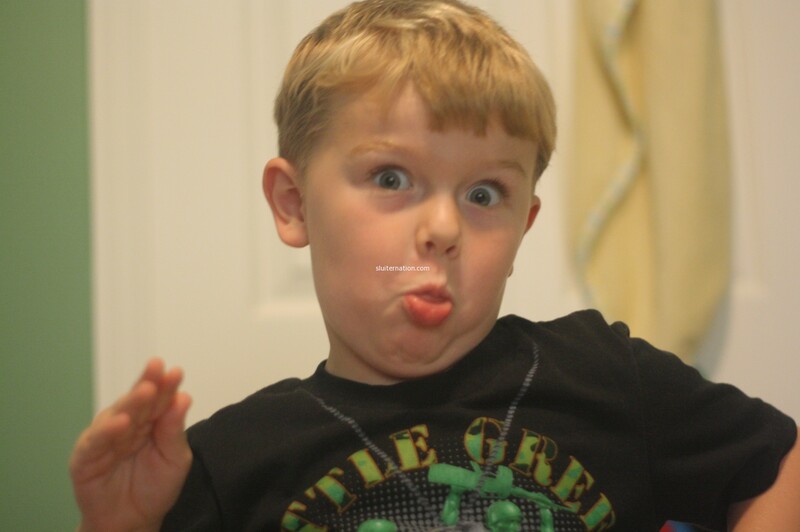 Pay day is Saturday at bedtime. Each week he has the potential to earn 7 quarters ($1.75 for those of you slow at the math). The first thing he told me he was going to buy was something for Charlie. What a guy! I found him a little plastic mug to keep his quarters in by his bed, and away we went with the new plan. The first week he was so excited that he did everything eagerly and earned all seven quarters. Since then we have had him earn as few as three quarters, but there have definitely been more full weeks than I thought there would be. His little mug is filling up and at least once a week we dump them out and he counts them. Then I remind him that four quarters are the same as one dollar, so we group them into fours and count how many dollars he has. He doesn’t get the idea that they are each 25 cents yet, or how to count by 25’s, so I do any “remainders” for him. He has almost $10 saved so far and he is just so excited to go to the store and spend it on something. He keeps saying he wants to buy presents for other people with it. It’s enough to make my heart melt. Sometimes I come here to lament time moving so fast and crab about why my babies aren’t babies anymore. ahem. But I am finding that there is a lot of fun about watching our boys grow up and learn too. It’s a shame he is NOTHING like me. Heh. All of these new experiences and new challenges show more of Eddie’s personality. Most of the time I see myself loud and clear in his actions, words, and sighs of overwhelm. But sometimes, like when he does math super quick in his head (“super quick” to me means not using his fingers) or he kicks a soccer ball correctly without having to be shown how, I see Cortney’s traits peeking through. This parenting thing, man. It’s something. Way to go to teach him early! What a great way to do it. My son “works” for me and my daughter has had a weekend job since she was 14 – it’s so important for them to see how much they have to work in relation to what they want. As Christmas approaches, a great grandparent gift might be http://www.moneysavvypig.com – my Dad got them for our boys and I LOVE them! Not an affiliate link either, I promise! I so agree with you about this stage. I love this stage where they are learning new things and their little personalities are emerging. I see a little bit of me, a little bit of their father…..and some of their great grandmother thrown in for good measure. It’s amazing. Secretly…..I was eager for the baby stage to be over so we could get on to discovery of the big wide world. I like your responsibility chart idea — I need something new for mine too now that stickers are no longer “the thing”. After you and I talked about this on Facebook, we implemented chores with V and it’s been great. We have yet to actually implement a chore chart, but we probably should since she does well with visuals. She doesn’t quite have the concept of value down in terms of the money she’s earning, but she knows she’s *earning* and that’s the important thing. She has a piggy bank and she also made a little bank at church one Sunday out of an old cream cheese container, so she divides her earnings into the two banks – she plans to donate the church bank to our offering plate and use the piggy bank earnings to buy something for herself (which tells us we must be doing something right in the parenting department). We have yet to actually count her earnings, but she’s getting to the point where she’s questioning how much she’s saved, so we’re getting to that point. That first photo is picture perfect for what you are talking about. We could create a whole meme around that photo. Love it. I think this is a great idea. We’ve tried ideas like this with our kids, but they never stick. They work to get enough money for whatever thing it is they want and then they’re done. I need a different motivational technique. Or maybe I just need to be more strict. We have the same responsibility chart! We had it for our oldest, and now our youngest has started using it too. I love the idea of tying it to beginning money awareness. That last photo is awesome. My girls have a few responsibilities, but not that they get paid for. We alternate them feeding the cats, putting away the silverware, and helping with the laundry. If they do it with no argument, they get their clip moved up on the chart, which results in pom poms, which eventually results in a toy from the store. I know we should do more chores, but it’s overwhelming for my brain with three of them! My kids earn quarters too! It’s just the saving part they haven’t yet grasped. The spending is pretty much immediate (as soon as they have a dollar, they want to purchase a .99 app–I know.) Love all the pictures! we’ve only been sporadic with allowances so far, but i’m thinking it’s the incentive my twins need (they’re older, but still). thanks for this reminder, and GO EDDIE! Love this. Just love this. Love this. Your system for teaching him to earn and save money is genius! Knowing when children are ready to be challenged is one of the hardest things about teaching our kids how to do life. Way to go! !